MIT President L. Rafael Rief and Gov. Ricardo Rosselló. Gov. 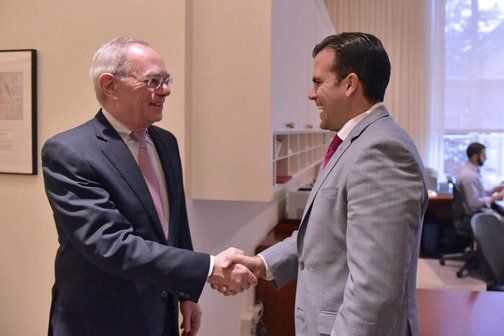 Ricardo Rosselló met with Massachusetts Institute of Technology President L. Rafael Rief to ask for the university’s collaboration during Puerto Rico’s recovery process. “The resources offered by this institution will be of importance in the development of cutting-edge design and execution, as well as excellence in the island’s reconstruction after hurricanes Irma and María,” Rosselló said. Present at the meeting were Carlos Mercader, executive director of the Puerto Rico Federal Affairs Administration, and Glorimar Ripoll, the Puerto Rico government’s chief innovation officer. After the meeting, Rosselló participated in the “Resilient Reconstruction of the Caribbean” Conference at MIT, where he stressed that innovation is a critical factor in achieving a better Puerto Rico. “The disaster, although it brought some challenges, also gave us some opportunities. For example, we had a 15-year vision for a new energy system in Puerto Rico with all the normal obstacles. Now we can start talking about remaking our energy system in three years, and make it much more resilient, modern, and effective,” said the governor. Rosselló then met with the MIT Association of Puerto Rican Students, who showed interest in integrating the issue of Puerto Rico’s reconstruction of into their respective university projects. As a 2001 graduate of MIT, Rosselló recognized the importance of this institution in his professional and personal development. Hey Buddy!, I found this information for you: "Rosselló asks for help to rebuild Puerto Rico after Hurricane María ". Here is the website link: https://newsismybusiness.com/rossello-rebuild-hurricane/. Thank you.